Review: Set during the Vietnam War. Captain Willard is sent on a dangerous mission. His mission is to be sent to Cambodia to assassinate a renegade colonel who set himself up as a god with the local tribe. One of the greatest classics ever to be made. Directed by the fantastic Francis Ford Coppola. This is a exhilarating, dazzling and exciting film. 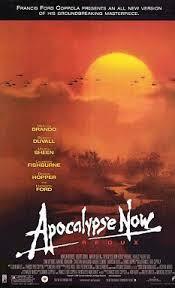 This film was inspired by a novel called Heart of Darkness by Joseph Conrad. Clint Eastwood, Steve McQueen and Jack Nicholson were offered the part of Captain Willard but all turned it down. At the Academy Awards in 1980 this won 2 Oscars. They were for Best Cinematography and Best Sound. At the Golden Globe Awards the same year it won three awards Best Director – Motion Picture, Best Motion Picture Actor in a Supporting Role (Robert Duvall) and Best Original Score – Motion Picture. Also the same year but at the Bafta Awards it won two awards. They were for Best Direction and Best Supporting Actor (Robert Duvall). At the Cannes Film Festival but in 1979 Francis Ford Coppola won the Palme d’Or Award and also a competition award called the FIPRESCI Award. This is on Barry Norman’s list of 100 Greatest Films of all time that he produced at the start of 2012. Reading Roger Ebert’s review for this he was saying that there have been a lot of films about Vietnam but the main reason why this film works so well is because ‘it pushes beyond the others, into the dark places of the soul. It is not about war so much as about how war reveals truths we would be happy never to discover’.